You don’t hear that phrase much these days (especially from ConDem spokespersons). Perhaps it’s because the stats for this last year—the year that Osbo forecast we’d start to see the positive effect of a paper money mountain for his banker chums to sit on—don’t look good for the peasants who aren’t among the twenty Cabinet millionaires. While those of us whose closest approach to Eton was a walking tour of Windsor, wages last year rose by 1%. And, while FTSE100 companies (& your pension pot) lost over 7% in value, compensation for their Chief Execs for climbing in and out of limos went up 11% to £3.65m. At the same time, the Second Baron Lord Strathclyde was protesting that the Conservatives “are not the rich and posh party“. But as a Belgravia mafia supplants the Islington mafia in fleecing the rest of us, a much more subtle, widespread and damaging fragmentation of our society is occurring at the other end of the social spectrum. Whereas the UK Government has always been the playground of the establishment, augmented by a small waves of arrivistes (c.f. Derry Irvine), a disconnect with the poor & excluded is no post-2010 phenomenon but something for which Blair and Brown carry as much blame as any Lord Snooty & chums. Because of frozen wages, social strains are starting to show in union belligerence and consumer spending. But that is, in turn, concealing some serious fractures between society and those who no longer feel a part of it at all. Once this was a phenomenon of American cities which the social justice agenda over here did much to prevent. But, after 13 years of Labour social programmes, the disenfranchised are now a significant chunk of society—mainly, but not exclusively, in our cities. Consider the news today that 495 properties across Scotland are now blacklisted by the Scottish Ambulance Service because paramedics and ambulance crews have been assaulted or otherwise abused when attending incidents there. Greater Glasgow and Clyde hold the dubious record of most “red-flagged” addresses in Scotland (125) but Lothian is close at 86; Forth Valley and Fife both have 53. It’s not just ambulances; over the last five years, almost 1,300 firefighters—an average of five each week—have been attacked when attending 999 calls and the trend is upwards. Add in incidents like the trainee social worker attacked by three teenagers while doing a home visit or that the number of deliberate wheelie bin fires has become close to an epidemic and alarm bells of social disintegration become deafening. Society is not rigid, nor should it be. There are misbehaviours that can be discounted, such as when students get uppity with eggs around Halloween. But at what point does the unthinking, gratuitous, menacing behaviour of a growing number become critical? A councillor for 13 years, it takes quite a bit to shock me. But recently, a couple with a young child came to see me to complain. They claimed to have been homeless and impoverished and our council’s homeless team managed not just to house them but to do it in the town centre of the place they most wanted to stay as the child’s nan was there. Their complaint? Not about the flat, nor the time taken to house them. It was that they didn’t have a parking space for their car and would I please fix that? Whereas my mother would have to have been at death’s door before asking for a doctor’s appointment, much less a home visit, we have a local who phones an ambulance to take him home when he gets too drunk to walk because he gets so abusive regular taxis decline to handle him. It’s not about teenage skaters who wreck wooden benches by using them as grind bars—they’re just daft and will learn, possibly even under their own steam. It’s about society’s switch to fixation on entitlement and dissociation with even some ownership—let alone responsibility—of using public services with care and consideration. No enlightened society neglects its elderly or its vulnerable. But in their attempt to outbid one another, major UK parties have trumpeted their social programmes without paying much attention to their effectiveness. In times of plenty, this may have been foolish but was still feasible. In times of indefinite fiscal constriction, such as we are now facing, that no longer applies. Whereas the number of social workers and those pulling down a decent professional salary while running charities or ‘third-sector’ operations has rocketed from virtually nil half a century ago, social funding now dwarfs every other area of government expenditure. 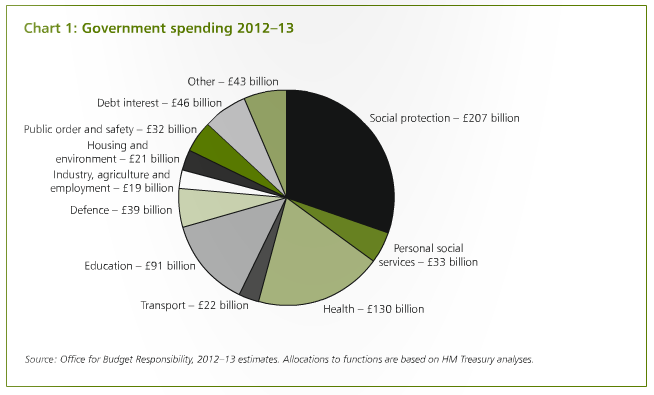 The UK numbers (taken from the Treasury’s 2012 Budget Report in March 2012) are shown in the chart below. The £207bn on Social Services (which includes all benefits, pensions, etc) represents 30% of all UK government expenditure but, because we’re running a whopping £91bn budget overspend, it’s a rather larger 36% of income. That represents £3,460 each year for every man, woman and child in the UK. Adding in the £2.7bn that Scottish councils pay out for Social Care, which is another £540 per skull and you’re talking a cool £4k per person. Now, given that three-quarters of the population are net donors—not (in theory) vulnerable, nor too old/infirm, not to mention in jail or on drug recovery programmes, you’re talking about over 1m people in Scotland each receiving an average £12,000 in state help. Leave aside whether such help is adequate or that thousands of carers deserve financial help and/or respite, with the economy on a steady downward track and the UK government paying some £600,000,000 each DAY in interest on what it has borrowed already, this is all careening towards a very big fiscal brick wall. So, while it is perfectly fair to demand that Chief Execs get their collective snouts out of the trough, it is equally fair to ask why people who attack ambulances or firemen or cause £130m in damage to wheelie bins are still entitled to any benefits. Of Scotland’s 49,618 criminal offenders last year, 27,813 (over 57%) were re-offending and this after decades of ‘enlightened’ attitudes among police, social work, municipal organisations and sundry charities. When careers advisors say “There are thousands of charities in the UK, employing well over half a million people full-time” this is not to say that they may not be a cost-effective way of providing essential services, often to those most in need. But they also become a self-interested party. While the ideal of such charities and, indeed, of social work in general, ought to be to put themselves out of business by succeeding, so far, this has not happened. And, while it would be unjust to blindly equate benefits recipients with wanton damage and unnecessary cost to society, it is not fat bankers who are setting fire to wheelie bins and stoning the firemen who show up to put them out. Both extremes of society need to make themselves included and respected within the whole; both must take responsibility to do that. There are plenty of third-world communities working miracles with the paucity of aid that actually reaches them that could teach us what can be done. But, if the middle keeps getting squeezed between greedy rich and ma-giro’ll-do-me-jist-fine types, then the present fiscal squeeze will fragment society further, undermining any sense that “we’re all in it together“. After a further couple of years, look for something very like revolts that will, by comparison, make community charge riots seem like bliss. 1 Response to All In It Together? come often to read through your blog posts!